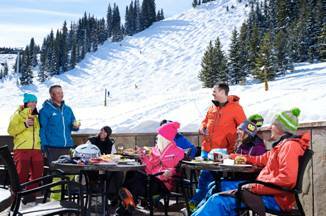 To better cater to guests during the Easter holiday period Vail Mountain, one of the largest ski resorts in the world, announced Thursday that it will adjust operating hours to 9 a.m. to 5 p.m. from Saturday, March 28 through Saturday, April 11, 2015. Vail’s Back Bowls and Blue Sky Basin lifts will close according to their regular schedule during this time while most Front Side lifts will remain open until 5 p.m. On-mountain restaurants, Adventure Ridge, the Vail Ski & Snowboard School and the Small World Nursery will also adjust hours to accommodate guests’ needs. Beginning Sunday, April 12 for the final week of the season, operating hours will shift to 9 a.m. to 4 p.m.